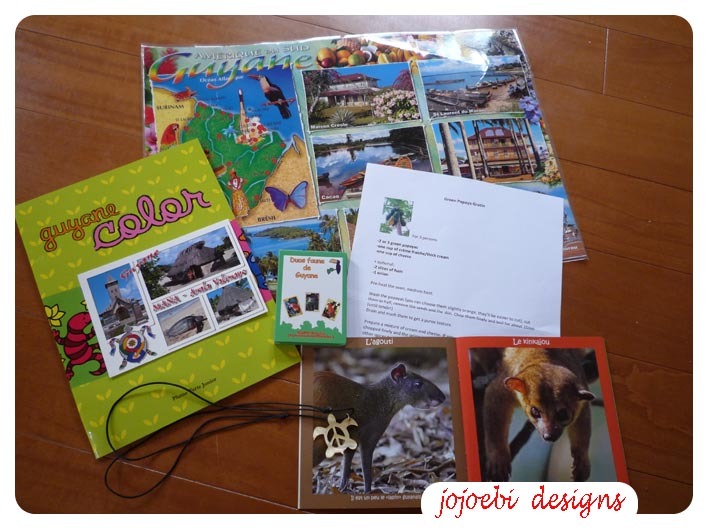 A while back I made some gifts for a little girl in French Guiana, well after sending a few emails back and forth her mom and I decided to do a culture swap, we got the package the other day with some lovely things to add to our South American box. It included a pretty necklace, colouring book, beautiful picture book of native animals, a card game with the native animals on the cards, a CD of French kids songs and a recipe which sounds delicious but it uses papaya which I can't get hold of, any ideas on what I could substitute instead of papaya? the dish is a kind of gratin. might try sweet potato then, I would have thought it would go sloppy with tinned papaya.